Job dissatisfaction drove three women to overhaul their careers — and in the end, transform their lives. Morgan Robinson had always wanted a career in the nonprofit sector. Her dream was realized as an editor for a nonprofit medical organization, although over the years her workplace more than tripled in size, changing the culture. She realized it was no longer the right fit for her. "It was terrifying to leave a well-paying, respected job in the midst of a crumbling economy," she says. But she also valued her happiness, so two and a half years ago she quit. If she was going to make such a drastic change, Morgan decided her new career would have to benefit her family and allow her to spend more time with her kids. 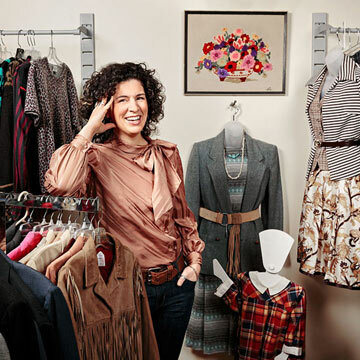 A lifetime of thrift shopping and an artsy hometown filled with young families, people of varied income levels and an influx of hipsters led her to open Frugal Resale, which sells gently used and vintage clothing, shoes, handbags, puzzles and other items for women, men and kids. Every month the shop donates 2% of sales to different local and national charities. The Robinsons live a block from Frugal Resale, making it practically their second home. When her husband isn't at work or their kids aren't at school, they can often be found moving clothing racks, bagging up blocks and puzzles, or sweeping the sidewalk. But even though the family was spending more time together, Morgan was often distracted by her new responsibilities. She knew she needed to honor her promise and take advantage of her new schedule, and she wanted to dedicate a day just to her kids. Last summer she gave herself every Monday off to take the kids on adventures. Morgan hopes that when they are older they won't just remember the paperwork and merchandise that shared their home but also these special outings. While Morgan never envisioned running her own store, she's rewarded by learning something new every day. She explores her creative side with marketing as well as designing the store's window and interior displays. While she spends most days in her shop, it never really feels like work. The joys of owning her business are great and small: She plays the music she likes, wears what she wants, throws special events like Ladies' Nights and Mother/Daughter Days, and participates in the town's various festivals. Morgan feels a sense of ownership in every meaning of the word, although there are things she misses, such as the freedom of having Saturdays off. "Every change is a trade-off, but I'd do it again in a heartbeat," she says. "I don't get paid vacation days, and I have to pay for my own benefits. But the quality of my daily life has improved tenfold. I'm simply happier." Vicky Kuo was 5 years old when she went on her first plane ride. "I felt like I was in heaven skirting the tops of the clouds," she says. Back then, though, she didn't know there was another way to fly besides being a passenger. She entered college when she was 16 to pursue her parents' dream of her becoming a doctor. At 22, she married and suspended her full-time studies, became a lab researcher at a university hospital and started a family. She told herself that once her youngest was in kindergarten, she could begin training again to become a physician. That plan was derailed when her third daughter was born. "If I went to medical school, they would have no mom," she says. "The children came first." In 2005 Vicky's kids, then ages 8 to 17, were still her main focus. Her flexible researcher's schedule allowed her to ferry them to early morning swim practice and music lessons, and still prepare dinner every night. While her discoveries about Alzheimer's disease were recognized, the work seemed repetitive. Alone in her lab, Vicky felt cut off from the world. In her mind she hadn't succeeded as a doctor. And though to outsiders she and her husband looked like the perfect couple, they had grown apart. "I felt like a failure at everything," Vicky says. "It took all I had to do my job." Realizing Vicky was unhappy, her husband surprised her with a gift certificate for flying lessons. Immediately Vicky began reading one of the textbooks that accompanied the gift — then snapped it shut and put it away. "It looked overwhelming," she remembers. "And I'd had enough of school." But nine months later, Vicky changed her mind. "I thought, 'Instead of burying yourself in books, just fly.' " It took only one time behind the controls of a plane for her to become hooked. "It's this sense of freedom and an adrenaline rush that comes from defying gravity," she says. "The need to get back up in the air was so strong I scheduled a flight for the following day." That November, after consulting her family, she quit her job and began training to become a pilot. "It was a huge leap," Vicky says. "Either I was going to fail or I was going to make it." Vicky delved right in, but studying up to eight hours a day for her pilot's license took a toll. Her already shaky marriage crumbled further, and the kids weren't used to not having her full attention. "I wasn't the perfect mother anymore," says Vicky, who felt so guilty that she considered returning to the lab. "It was a rocky time emotionally," she says. "I needed to talk to someone to let out my anxieties." A consultation with a life coach convinced Vicky that she was entitled to take time for herself. But despite all their efforts, Vicky and her husband divorced in 2007. "We had tried for years to make the marriage work," she says. "Whether I flew or not, it would have happened." Earning an instrument license allowed Vicky to fly. Gaining her commercial license in 2008 enabled her to start teaching at Horizon Aviation in Providence, where she had trained. In 2011 Vicky was named chief flight instructor. "I was ecstatic," Vicky says, and she was thrilled to be able to pass on her love of flying to her students. "People come in here with a dream, and it's my job to empower them the way I was empowered." Now on good terms with her ex-husband, Vicky is grateful for his gift that allowed her to take wing. Don't drive yourselves too hard, she tells her children. Instead, leave room to discover your dreams. "They've seen the hard work, the stress and the achievement," she says. Vicky believes that if her parents had shared their failures as well as successes, she might have found her own passion sooner. "The exhilaration I experience every day when a plane takes off is almost indescribable," she says. "I've become the person I'd always wanted to be — it's a wonderful feeling." When Robin Martinelli became a single mom at age 20, she urgently needed one thing: health insurance. She visited a sheriff she knew for advice and left with a job as a deputy. Robin turned out to be a natural, but the 12-hour shifts didn't jibe with being the mom her son needed. Coleman was hyperactive, and full-time day care was tough for him. Understanding as her commanding officers were, they couldn't let Robin walk beats with a toddler in tow. Looking for a more family-friendly career, she found one when she hired a process server to obtain some of Coleman's medical records. Robin talked the company into taking her on as a trainee on her days off. After two years of working two gigs, she finished her on-the-job training, quit the sheriff's department and opened her own company, Coleman and Associates. Coleman went to work with his mom almost every day. Process serving was an adventure for him. "We would track down people at the gas station, church, their girlfriend's house," says Robin. "It was perfect for a kid with attention problems." But some of the recipients of subpoenas, summonses and complaints were uncooperative. "Once a man came out with his Rottweiler," Robin recalls. "The dog was faster than he was, so I threw the papers, grabbed Coleman and ran for our car." Robin had kept the car running. "The dog was clawing at the door," she recalls. Robin realized that in addition to a job that let her make her own schedule, she needed something less prone to confrontation — and more lucrative. Also, her family was about to grow. Robin had been volunteering as a baseball coach, and several boys on her team insisted on introducing her to a widower from their church. On her 32nd birthday, Gwinnett County Police Department Corporal Doug Martinelli showed up for a game. The two were married six months later. She adopted his two daughters, and he adopted her son. As Coleman had a decade earlier, all three kids now inspired Robin to make another change, to become a private investigator. Robin studied, trained and earned her individual license in 1999. "Sure enough, within weeks I secretly filmed while we were out 'shopping,' and snapped photos of a cheating husband while we were 'looking for our lost dog.' " Soon surveillance was the shared family pastime. Growing a business together turned out to be a perfect way to build a new family, says Robin, since you have to share goals and be a team. When eldest daughter Kristi turned 18, she earned her PI license, most likely becoming the youngest PI in Georgia. The other two Martinelli kids followed suit, as did Robin's mother, Connie, now 70, making her among the oldest PIs in the state. Coleman recently returned from a tour in Afghanistan with the marines and is working as a PI with Robin. Kristi, an aspiring police officer, is a process server for her mom, and Kelly is a supply specialist in the army. "It's not surprising they're all choosing work where you have to have your brother's back. That's a core value they were raised on," says Robin. "I hope they also learned that it doesn't take a lot of money, just determination, to turn a dream into a reality." Originally published in the May 2013 issue of Family Circle magazine.